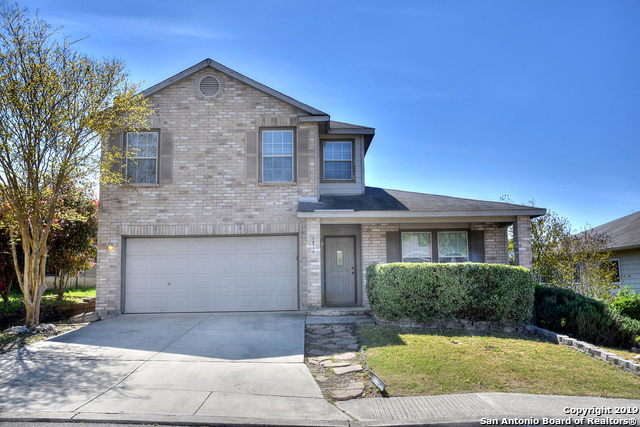 All Creek Haven homes currently listed for sale in San Antonio as of 04/22/2019 are shown below. You can change the search criteria at any time by pressing the 'Change Search' button below. "Reduced Price, Newly renovated, Stunning 2-story, 3-side stone home on .24 acre large corner lot, where you will find space for everyone. Porcelain tile throughout 1st floor, carpet and wood floor upstairs. New granite countertops, new stainless steel appliances and white beautiful cabinets in large and bright kitchen. Enjoy movie night in spacious game room, and study has great space for home office. Don't forget the outdoors, expansive backyard and covered deck. Huge closets and pantry for sto"
"Beautiful well kept, clean home in Bulverde Village. Close to 281 and 1604 and acclaimed golf course at TPC. Home boast 3 living areas. Game room has a separate space you can make your own into a media room or office space. Nice size covered patio and sprinkler system . Separate tub and shower and large walk in closet in Downs stairs master bedroom. The three living areas are nicely spaced through the home .Come see this beautifully laid out home." "PERFECT LOCATION in Beautiful Bulverde Village in NEISD! This beautiful open floor plan is an entertainer's dream w/ 2 living areas: Spacious Upstairs Media/Gameroom! Beautiful Tiled Kitchen with Tons of Cabinet Storage & Counter Space. Master Suite downstairs w/ Garden Tub, Dual Vanities, Separate Shower & Walk-in closet! Security System, Ceiling Fans, Flooring in attic for extra storage, full sprinkler system is already in place! Garage Keypad. INCREDIBLE PRICE ...Welcome Home!"